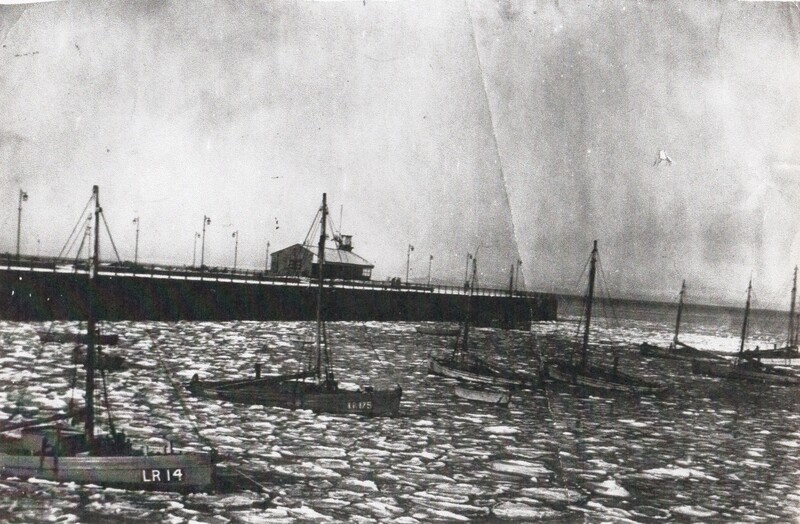 Sheltering from the ice in the old harbour, “Young John” LR 14, “Volunteer” LR175, and other shrimpers, December 1940. “Young John” was registered at Lancaster as LR 14 having been built by Crossfields of Arnside in 1908. The boat had a motor and was smack rigged with a mainsail, gaff topsail, foresail and jib. She was 27ft 9in overall with a beam of 8ft 7in and weighing 6.08 tons. Built originally for John William Woodhouse, she was sold to Harold Priestly 15.7.42. “Volunteer” was registered at Lancaster as LR 175 having been built at Crossfield’s of Arnside in 1917. She had a motor and was rigged with a mainsail, topsail, foresail and jib. She was later owned by George Mount of Morecambe, James Morley of Morecambe (6.10.23) and Dennis Aldren of Morecambe (22.5.53).